ShilpaAbhimani - 2018, Presidential Awards Handicrafts Competition & Exhibition which showcases the excellent creations crafted by magnificent handicraftsmen of Sri Lanka, will be held from September 12 to 16 at the Safaire Banquate Hall, Bandaranaike Memorial International Conference Hall. ShilpaAbhimani - 2018, Exhibition which is organized by the National Crafts Council functioning under the Ministry of Trade and Commerce will be ceremonially declared open at 3.00 p.m. on September 12 under the patronage of H.E. 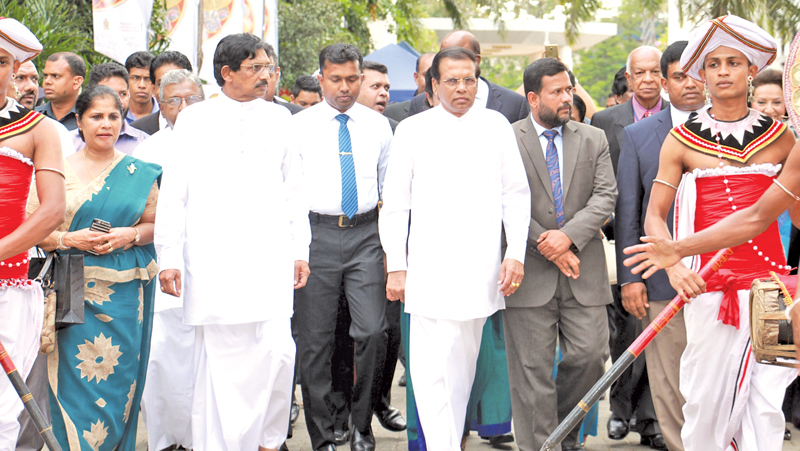 Maithripala Sirisena, the President of Democratic Socialist Republic of Sri Lanka and with the participation of Industry and Commerce Minister Rishad Bathiudeen and a number of Ministers and Members of Parliament. National Crafts Council was established under the provisions of the National Crafts Council and Allied Institutions Act, No. 35 of 1982 with the objective to preserve and foster Sri Lankan handicrafts and artisanal products which claim for a proud history of over thousand years and to uplift the economic and social status of the handicraftsmen. Around 26,000 handicraftsmen from all parts of the island have been registered with the National Crafts Council which has undertaken a host of programmes to fine-tune the magnificent skills of these handicraftsmen and also to uplift their economic and social standings. Among them, the implementation of training programmes, cultivation of raw materials and distribution of scarce raw materials, providing them with necessary equipment, development of Shilpa Gammana, promotion of both local and foreign markets, and development of enterprises are few to mention here. There are nearly 112 handicraft training centres in operation all over the island under the National Crafts Council, and various handicraft training courses are conducted at these training centres. 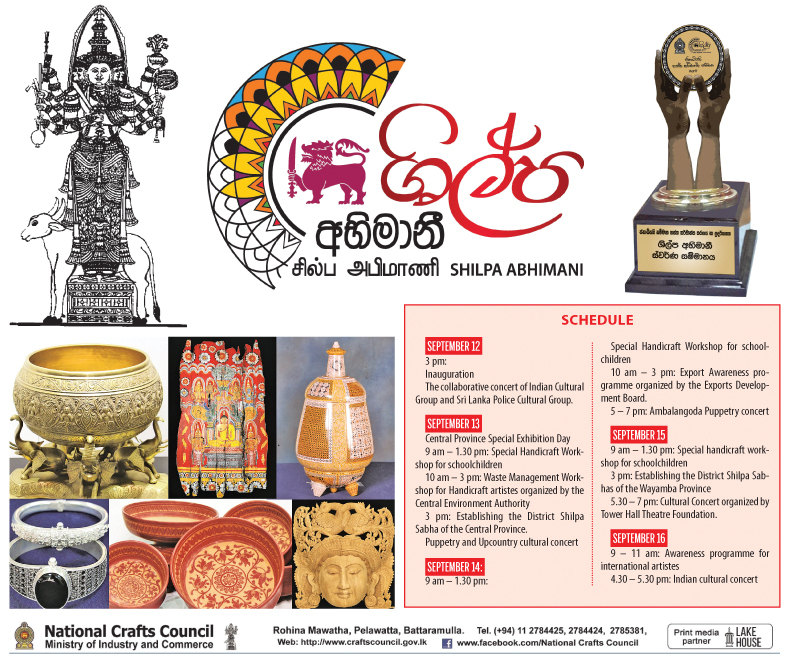 The objective of the “ShilpaAbhimani - 2018”, Presidential Awards Handicrafts Competition & Exhibition is to enhance the artistic talents of handicraftsmen scattered all over the island, to conduct a competition to showcase the said talents of the handicraftsmen and thereby to create in them a national value and a pride. “ShilpaAbhimani - 2018” is not a mere competition but it is a development programme implemented in three phases. In the first phase of the event, training workshops to create awareness were conducted to cover all 25 districts of the island. These programmes are aimed at enhancing the creative talents of the craftsmen and improving the quality and finishing of the artefacts; and also to introduce new designs. Senior lecturers of the University of Moratuwa, University of Visual and Performing Arts Colombo, and the University of Peradeniya are participating in these workshops as special lecturers. Under the second phase, competitions and exhibitions are conducted at Provincial levels with a view to showcasing the talents of the handicraftsmen and these exhibitions are organized by the respective Provincial Ministry of Industries, Departments of Industrial Development and National Crafts Council. It should be stated here with appreciations that 8115 creations from 4138 craftsmen have been presented for the Provincial competitions. ShilpaAbhimani - 2018, Presidential Awards Handicrafts Competition & Exhibition is held in the third phase and 1418 creations which won awards at Provincial competitions will feature in this exhibition. These creations will be adjudicated under 57 streams by a National Judge Panel comprising Professors, Doctors and Lecturers from a number of Universities. Two outstanding creations among these creations will be selected for Golden Award under the Traditional and Non-Traditional categories. Further, 21 other artefacts selected under each sector will be awarded Silver Awards and National First, Second, and Third and Merit Certificates. Arrangements have also been made to present the two Golden Award winners with cash prizes worth Rs.500, 000/- each and cash prizes of Rs. 50,000/- will be awarded to Silver Award winners. Action has also been made to implement special programmes in parallel with the “ShilpaAbhimani - 2018”, Exhibition. Plans are underway to provide the handicraftsmen with 110 trade stalls with a view to facilitating them to sell their products direct to the customers in order to resolve the market issue faced by craftsmen in selling their products. The said trade stalls will include stalls selling products such as Batik, Lace, Embroidery, Patchwork, Silver Jewellery, Brassware, Lacquer, Clay Ornamentals, Musical Instruments, Dumbara Designs, Reed and Grass Creations, Cane and Bamboo products, Masks, Handlooms, Wood Carvings and domestic food items. An International Festival has also been organized with the intention to provide the visitors to and the handicraftsmen participating in the “ShilpaAbhimani - 2018 Exhibition with an in-depth knowledge about the domestic and foreign handicrafts. 25 craftsmen representing India, Bangladesh, Nepal, and Malaysia will be participating in the Exhibition. The Export Development Board will conduct a special workshop on the exporting process to enhance the knowledge and comprehension of the handicraftsmen on the production and exportation. Nearly 100 Master Craftsmen, Training Institute Instructors and craftsmen engaged in the export of their products will participate in this workshop to share their experiences with the participants. Arrangements have also been made by the Central Environment Authority to conduct a workshop on Waste Management where the craftsmen will be able to gather knowledge as to how the wastes of Batik, Reed, and Talipot production processes and the use of environmental friendly raw-materials for productions as an option to plastic and polythene usage will also be discussed in details. A considerable number of youths entered the handicraft sector through the “Shilpa Navoda - School Handicraft Competition conducted last year and the success of the said competition inspired us to conduct a special handicraft training workshop for school children alongside the “ShilaAbhimani -2018” Exhibition. A cultural pageant showcasing significant features of both local and foreign cultures entwined with artisanal creations which signify the cultural identity will also be held in the evenings of every day during the period of the exhibition from 12th September to 16th September for the viewing pleasure of the visitors. Puppet shows of Ambalangoda fame and dancing items performed by the Police Cultural Troop and the Indian Cultural Troop will add colour and glamour to the cultural pageant. On September 13, the day dedicated for the Central Province, a colourful Kandiyan Dancing pageant too will be held. The “ShilpaAbhimani - 2018” Exhibition will be open for the public at the BMICH from September 12 to 16 from 9 am to 8 pm. “ShilpaAbhimani - 2018” Exhibition will be an excellent opportunity to view and purchase magnificent beautifully decorated artisanal creations made by the magical hands of our own handicraftsmen.